Harpsichords are shaped roughly like grand pianos. The sound is made by the action of the keys, which make the quills pluck the strings inside the instrument. This example was made by Pascal-Joseph Taskin I (1723-1793), who was instrument maker to the court of Louis XVI of France from 1774. It is specially fitted with a small keyboard with unusually narrow keys, and can only be played by a child or someone with very small hands. 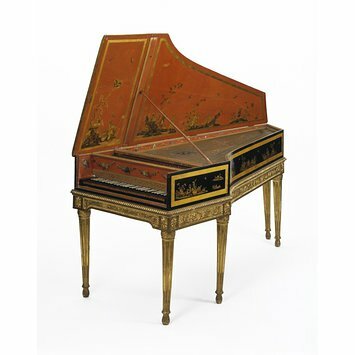 It could have been made for a girl, or for a person such as Louise-Honorine, Duchesse de Choiseul (died 1801), an accomplished clavichord player of diminutive stature who had small furniture specially made for her. The case is decorated in imitation of Japanese lacquer, with japanned figures in oriental poses playing oriental instruments. The decorator, possibly M. Doublet fils (active 1783-9) was probably inspired by the contemporary fashion for incorporating old Japanese lacquer panels into French furniture. 'The case is japanned, the outside being black, while the inner surface of the lid, the inner faces of the case and the keyboard surround are a coral-pink colour. (It is believed that this interior colour was originally a clear pink and that the present shade is the result of overpainting, presumably during early restorations, and of the yellowing of the layer of varnish over the paint). Both the inside and outside of the case are decorated with gilt chinoiseries consisting of small figures in fantastic landscapes. The stand has five fluted legs and is carved and gilt. Three chased brass hinges attach the lid to the spine and two slightly narrower ones of the same type join the two parts of the lid. Adapted from Howard Schott, Catalogue of Musical Instruments in the Victoria and Albert Museum. Part I: Keyboard Instruments (London, 1985), p.102. * Sheridan Germann, 'Monsieur Doublet and his confrères: the harpsichord decorators of Paris', Early Music, viii/4, (1980), 435; ix/2 (1981), 192. Painted around the rose hole on the soundboard. Behind the nameboard, written in ink. Charles Fleury was a specialist in the repair of early keyboard instruments. Inscription branded on the lowest key with the date in ink at the distal end. Taskin's trade card was discovered glued to the inner surface of the bentside by John Barnes in 1971. Written in red pencil behind the nameboard. In a similar hand and also in red pencil, behind the nameboard of Pascal Taskin's own harpsichord, built in 1769 and now in the Russell Collection, Edinburgh, is the name 'Pascal'. It is possible that both these notes were written by Taskin himself. The harpshicord, referred to as a 'Spinette' was purchased directly from Paris. The report of the Museum's Art Referee, Matthew Digby Wyatt, stressed the high quality of the decoration and included in his report a small sketch of the instrument. Two major restorations of this instrument are recorded. By about 1800 the piano had supplanted the harpsichord as the most popular keyboard instrument and old instruments were discarded. In 1856 - before the Museum acquired it - Charles Fleury in Paris restrung the harpsichord using new wire of tensile strength similar to eighteenth-century wire. He added an extra course of strings at the treble end and shifted the keyboard a semi-tone to the right, to allow the strings to be tuned at a higher pitch than was normal in Taskin's time. Fleury's work was an early example of restoration of harpsichords in the spirt of the Early Music Revival. His alterations were reversed during the restoration of the instrument to as near original condition as possible in 1971. The rosette takes the form of a gilt-metal Maltese Cross; it is unlike any other surviving example by Taskin and is thought to be a later replacement. Wilk, Christopher, ed., Western Furniture 1350 to the Present Day. London: Victoria and Albert Museum, 1996. 230p., ill. ISBN 085667463X, pp.134-5. 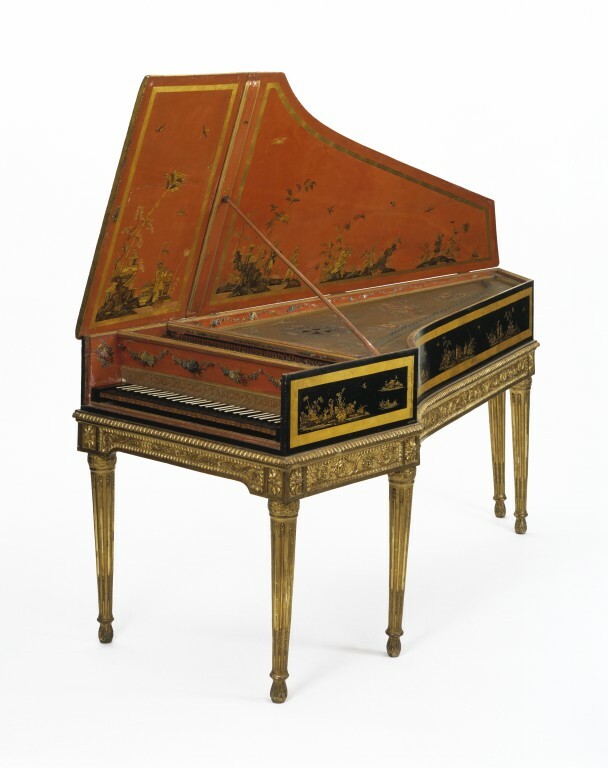 Harpsichords were popular domestic instruments until about 1810. They were also valued as luxury decorative furniture. This one is painted with chinoiserie scenes and decorated in imitation of Asian lacquer. It is an unusually small instrument, so could have been played only by a child or an adult with very small hands. In the 18th century people made their own entertainment, like giving a concert at home for family and friends. A wealthy family might have owned a harpsichord like this one. The keyboard on this instrument was designed for little hands. The case japanned and decorated with chinoiseries; the soundboard painted with flowers. Carved and gilded stand. The compass is EE -f3, chromatic. The keys are unusually narrow and the instrument was probably designed for a child - probably a girl. Taskin was one of the two most famous makers of keyboard instruments in Paris at this date. With its elaborate case, this instrument can only have been made to stand in very splendid surroundings; indeed, this instrument may be regarded as an important piece of dated 'Louis Seize' furniture in its own right.